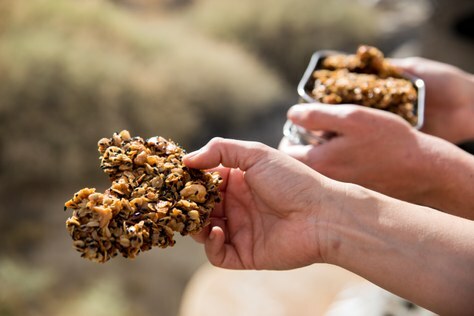 Your trail mates will give you new respect when you share this "Granola Brittle" from Dirty Gourmet: Food for Your Outdoor Adventures, a new cookbook. I've lived a charmed life, insofar as I like to eat and have a spouse who loves to cook. I'll gladly wash dishes as my part of this bargain, a chore I've managed with a moderate degree of competence. That said, I was intrigued by a recipe in Dirty Gourmet: Food for Your Outdoor Adventures, a new cookbook from Mountaineers Books. "The first event we did as Dirty Gourmet was an art fair. Not so outdoorsy, but people were 'hiking' around looking at and purchasing all sorts of art—and they got hungry doing it. We made several products to sell there, but the main thing people wanted to buy was our granola. We offered two flavors, and both sold out (and there was a wait list!). Line a large rimmed baking sheet with a silicone mat or parchment paper. Set aside. In a small saucepan, combine the brown sugar, oil, honey, and salt. Cook over low heat, stirring frequently, until the mixture is hot and just starts to bubble. Remove from heat. In a large bowl, combine the oats, cashews, coconut flakes, and sesame seeds. Add the sugar mixture, stirring to coat. Spread the mixture onto the prepared baking sheet and bake, stirring every 10 minutes, until the granola is golden (about 30 minutes). Remove from the oven and let cool completely. Break brittle into large chunks and store in an airtight container. "On the Trail," for snacks like this Granola Brittle that you make at home and bring on your outing. "Car Camping," for cooking over a campfire and other techniques that make really wonderful meals when you're planning to establish a camp and stage your hikes or climbs from there. "Backcountry," for lightweight, easy-to-bring meals when you're carrying everything you have on your back. Download a PDF of this and two more delicious recipes. 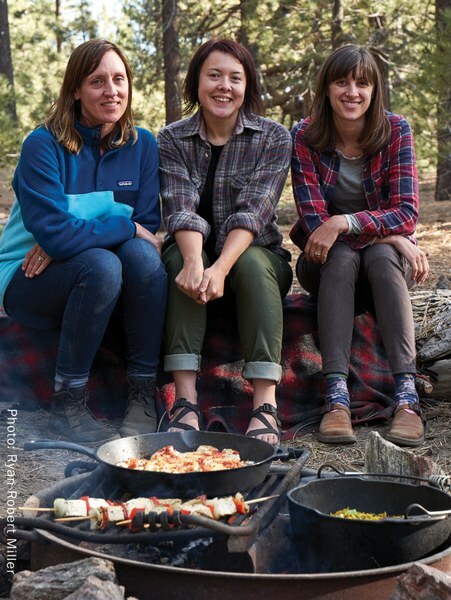 Take a deep dive into campfire cooking in a free online presentation and Q&A with the Dirty Gourmet authors. This online presentation will teach you how to make great meals over a campfire, using a variety of tools from standard pots and pans to a pie iron, dutch oven, and aluminum foil pouches. by Mai-Yan Kwan, Emily Nielson, and Aimee Trudeau.